The Reserve Bank building just off Flemming Square behind the Port Elizabeth City Hall has a pair of magnificent bronze doors which I bet a lot of people walk past without even noticing. 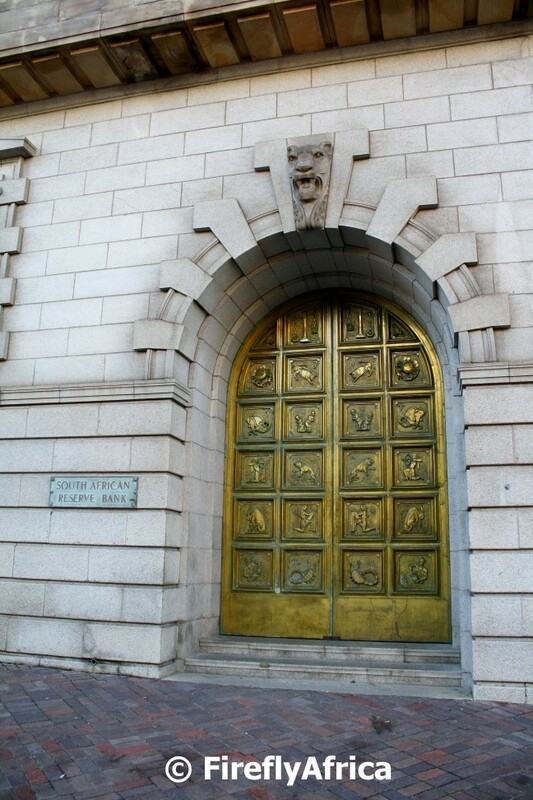 The doors were designed by Robert Bain in 1942 and represents the twelve signs of the Zodiac. With all the recent rain we had each river and stream, ditch and even my garden coming down in flood. The Maitland River is a very short river and at the best of times is nothing more than a trickle. Passing there this week I could see how wide it ran into the sea at the height of the rain and how it has gone back to normal barely a week after. The western point of Algoa Bay is called Cape Recife and it is surrounded by the Cape Recife Nature Reserve. The beach on the Algoa Bay side of the point is the kind of beach that is close enough to the city to be accessible, but far enough for a person to just get away from it all. 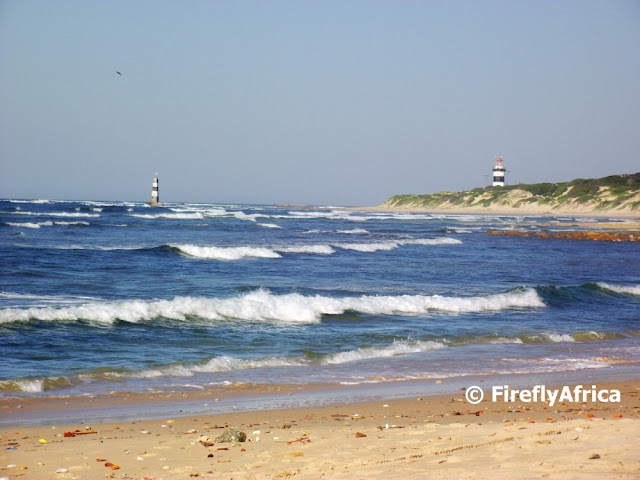 The view from this spot takes in both (on the right) the Cape Recife Lighthouse built in 1851, and one of the old shipping beacons on the left. I accompanied the webmaster of Nelson Mandela Bay Tourism on an outing to a couple of nature trails around Port Elizabeth to get some pictures for the NMBT website. I spotted this flowering bougainvillea at Dodds Farm in the Baakens Valley and, knowing me for a while now, when I told him to keep walking he knew just to (try and) look natural and not look back. 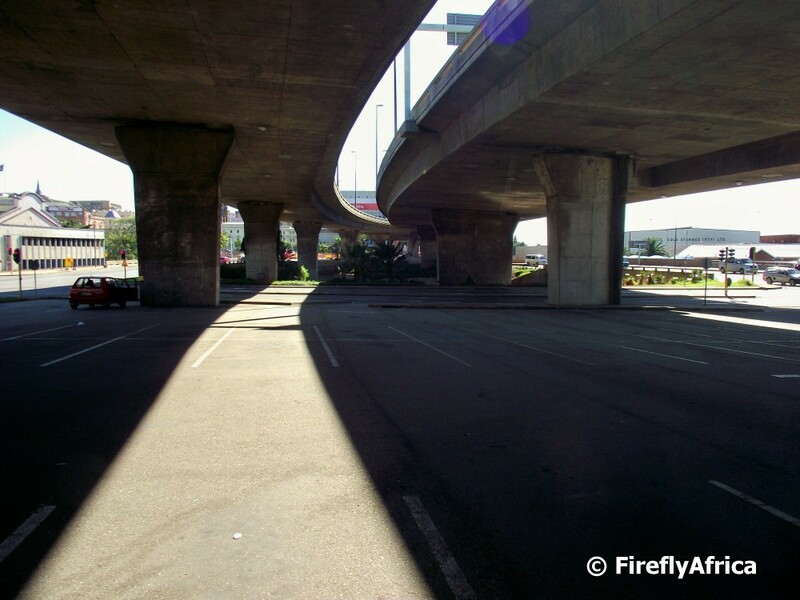 Standing under the Settlers Freeway across the road from the St Mary's Cemetery. The building on the left is the old dilapidated PE Tramways building (or really what's left of it) while the Baakens River flows towards the harbour in the channel below the greenery right in the middle of the picture. I normaly walk around with one eye looking out for a nice landscape and my other one scanning the ground for the little things. 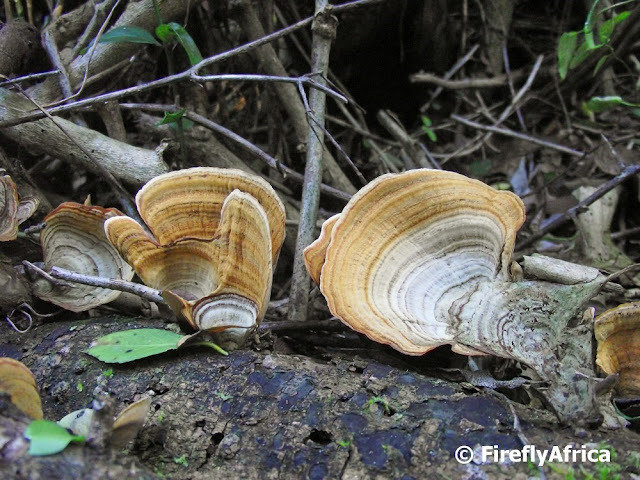 Mushrooms and fungi tends to often make for interesting photographs. This bracket fungus presented itself on the trail in the Maitland Nature Reserve. I am always amazed how many hiking trails there are around Cape Town and one tends to think that we don't have too many around Port Elizabeth. But people are wrong. 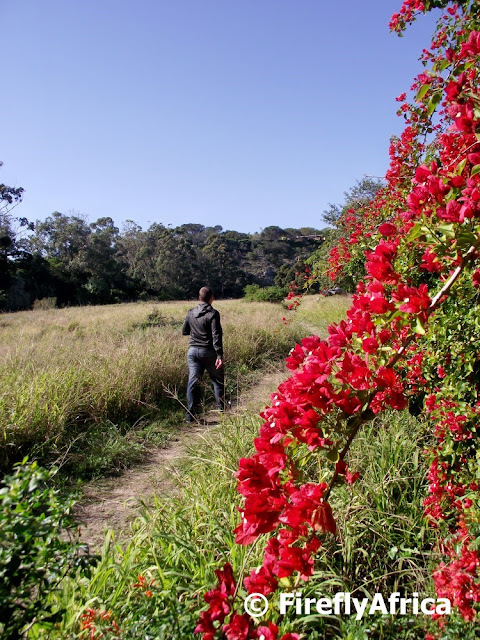 We may not have as many as Cape Town, but there are a great number of short and medium hiking trails in and around the city where you can escape from the hustle and bustle within 15 or 20 minutes drive from the suburbs. 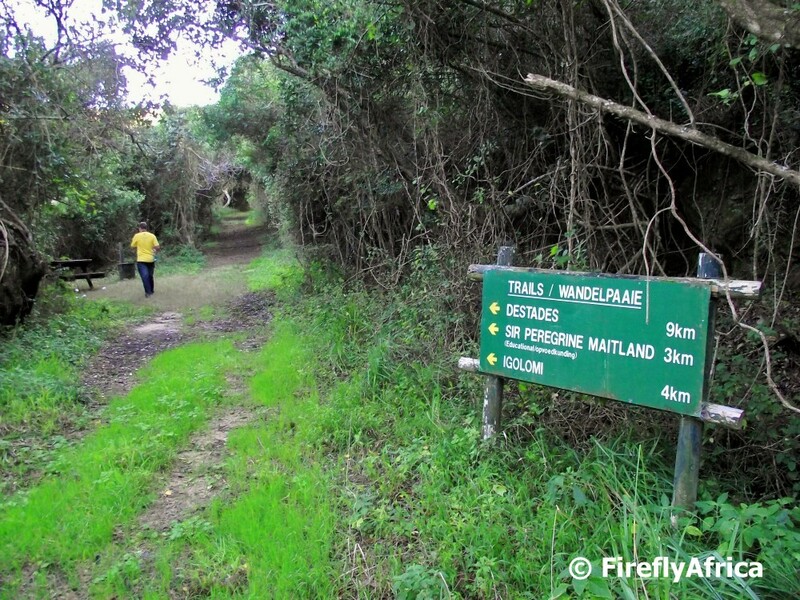 One of these is the Maitland Nature Reserve which offers a 3km, 4km and a longer 9km trail. All of them start along this section which is part of the old wagon trail from back in the days. The shadow of the Mackay Bridge over the Sundays River in Colchester east of Port Elizabeth. Just an extra photo for those who haven't seen the bridge, built in 1895, before. I have never enjoyed fishing even though my brother loves it. I just don't have the patience for it. Strange then that I can sit somewhere and wait for the perfect photo. Some people would ask, "Isn't it the same thing?" I don't know. Probably. 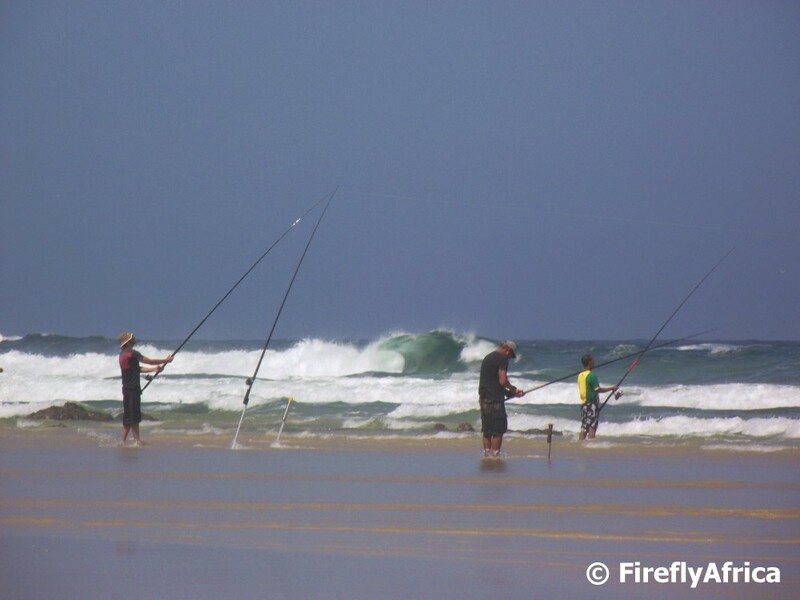 I just don't like to fish like these guys on Maitlands Beach. 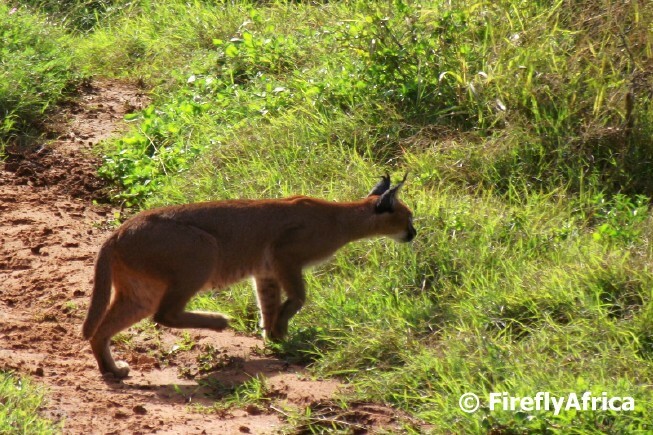 I have only seen rooikat (linx) in the wild twice. Driving through Addo Elephant National Park the Damselfly suddenly spotted something in a clearing in the bush. Yay! My third wild rooikat. Unfortunately for the photographer in me he was on the wrong side of the car with the sun behind him. Hence the crappy photo. Sorry. He was stalking something and suddenly pounced into the bush where he sat eating whatever he caught for about 5 minutes before walking off. "Oh, nearly there, nearly there... If I can just reach it..."
This post is in celebration of Addo Elephant National Park's 80th birthday this month. Former President Nelson Mandela turned 93 years old yesterday. Three years ago it was decided to declare 18 July, his birthday, Nelson Mandela Day and to appeal to people to celebrate the day by giving 67 minutes of their time to do something for the community. The 67 minutes represents the 67 years of his life fighting for the rights of humanity. 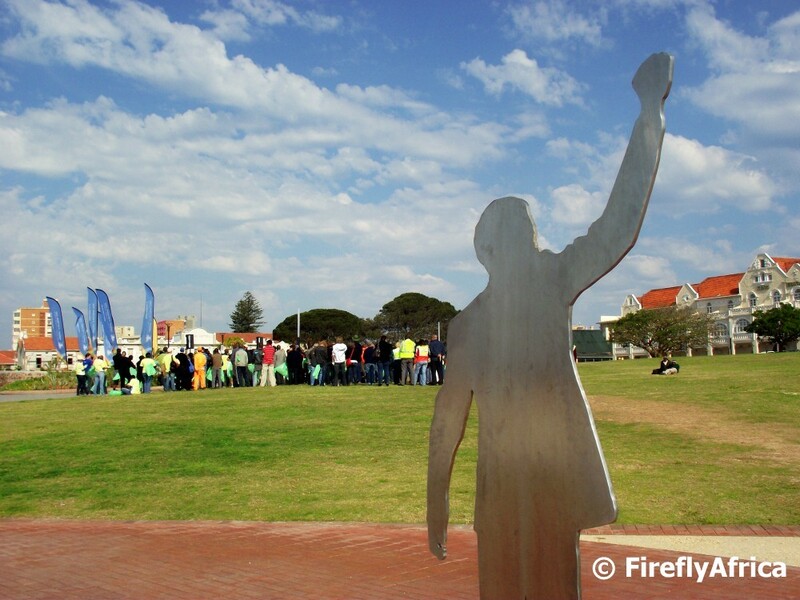 Nelson Mandela Bay Tourism organised a cleanup campaign around the Donkin Reserve and Fort Frederick along the Donkin Heritage Trail with the meeting place being on the grass at the Donkin Reserve close to the Mandela figure at the head of the Voting Line art piece. 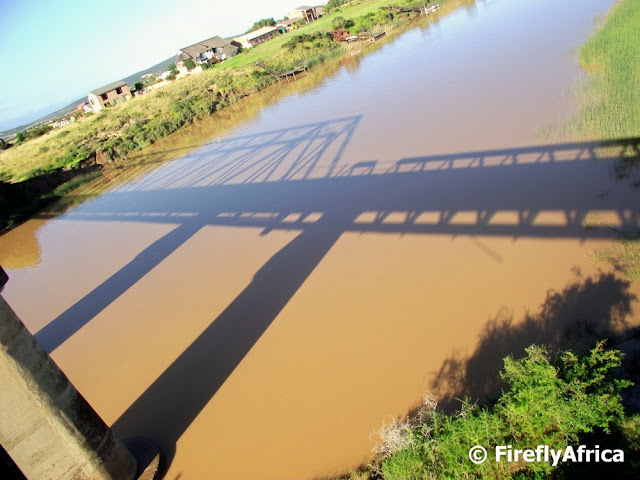 After showing you the views up and across the Swartkops River, I decided to add the view down stream as well, just for good measure. Looking up the Swartkops River from the same spot on the Aloe Trail from where yesterday's photo of the old power station was taken from. 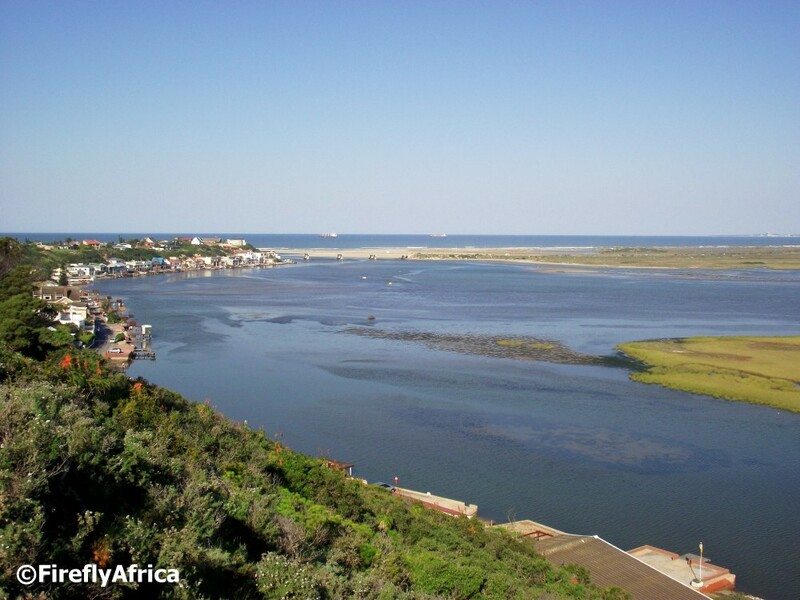 Standing at one of the view points on the Aloe Trail in Bluewater Bay there are great views both up as well as down the Swartkops River. 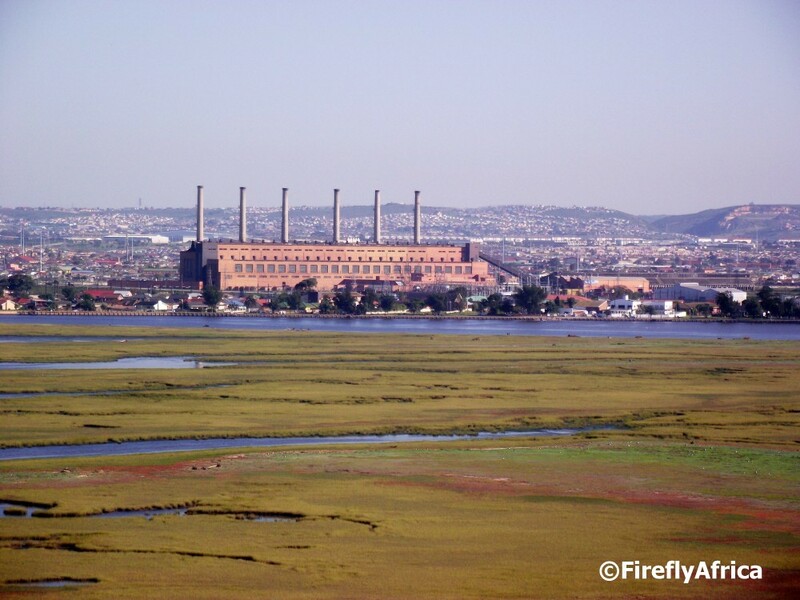 Looking across the river you can see the old Swartkops power station with townships and Northern areas in the background. 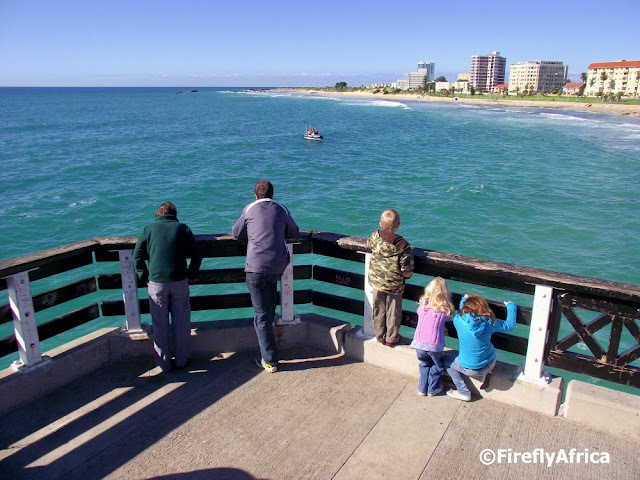 Port Elizabeth has some very beautiful and naturally diverse nature reserves in and around the city. The nice part is that they all have hiking trails through them and its possible to do them either on your own (always keep safety in mind and walk in at least a small group rather than on your own) or on a guided walk. 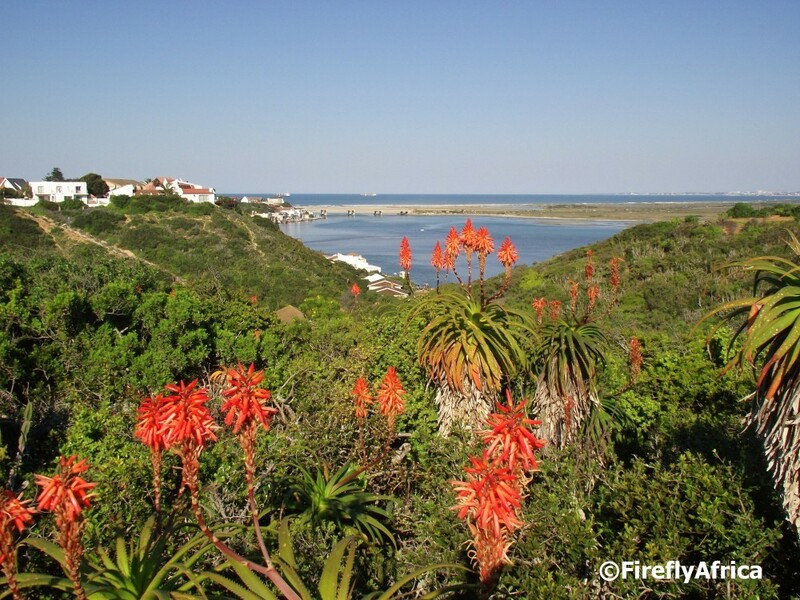 The Aloe Nature Reserve is particularly beautiful this time of year with the aloes in flower. 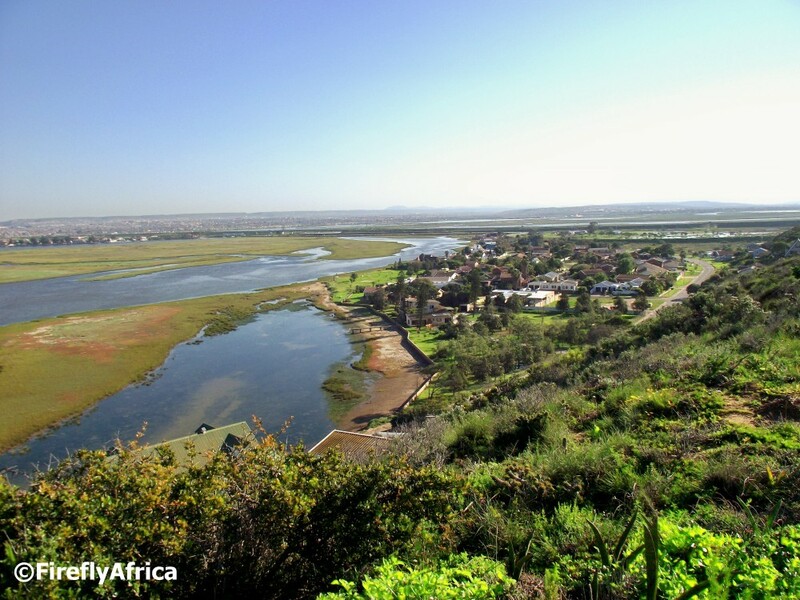 The reserve is situated on the plateau next to the Swartkops River and can be accessed from the top of Tippers Creek Road between Amsterdamhoek and Bluewater Bay. Last Sunday I tagged onto a guided walk through the reserve and although I only did the 2km trail and didn't stay with them for the longer 7km one, its was still a very informative hour out in nature. 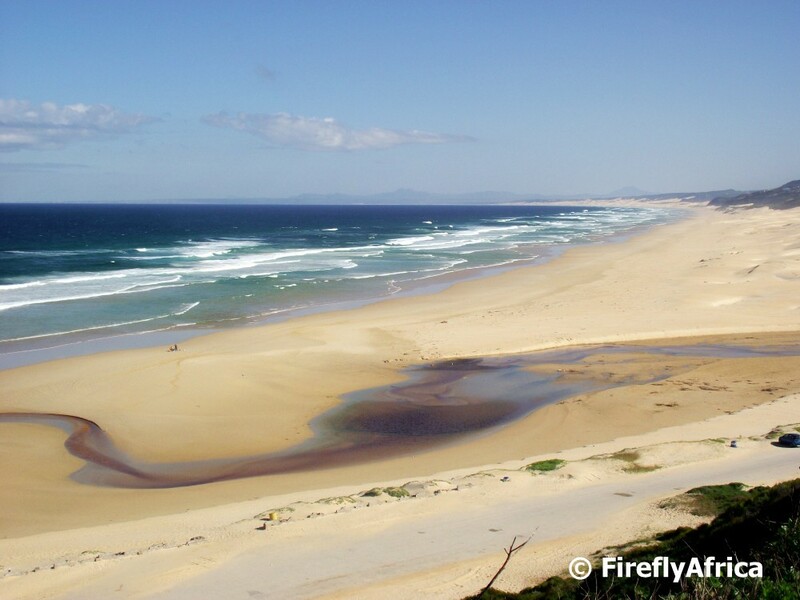 The photo is looking down towards the Swartkops River mouth. 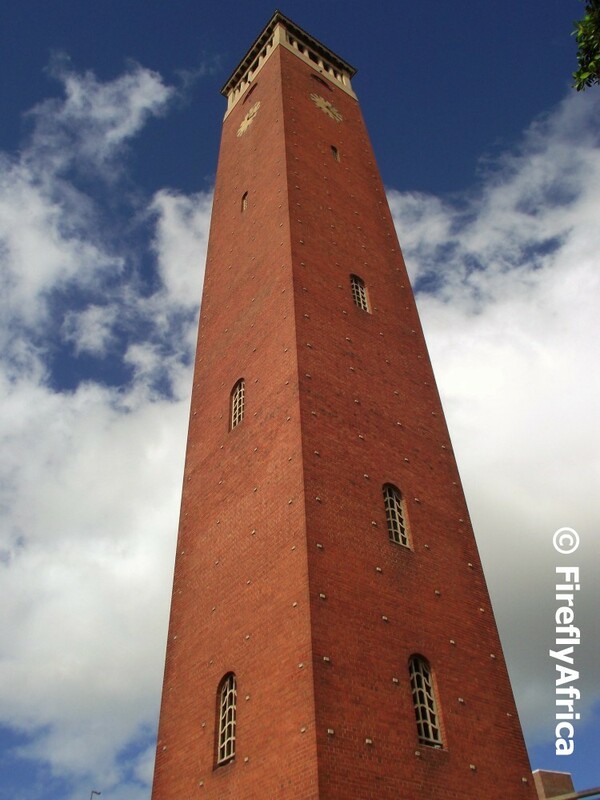 I know I posted something similar not too far in the past (so if you saw that one please excuse me), but I still wanted to post this picture looking up at the 52 meter high Campanile, built on the landing beach of the 1820 British Settlers. All the libraries within the city offers a holiday program twice a week for children. 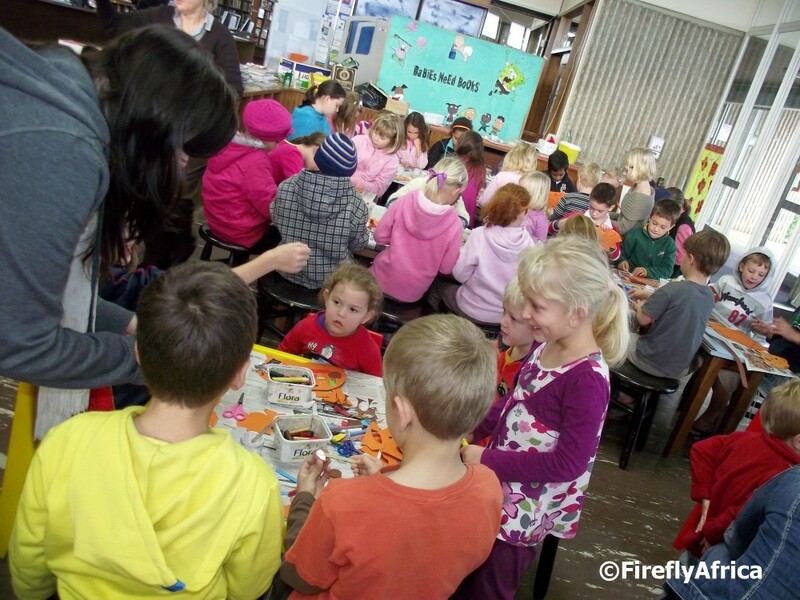 I took the Rugrats to the Newton Park library the other day and after story time everybody got cutting, colouring and pasting and made animal masks. 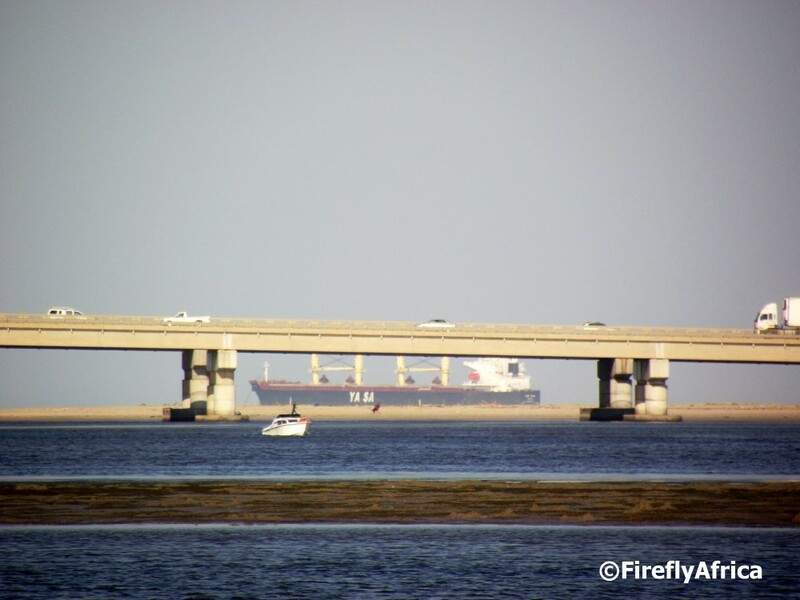 A ship out in Algoa Bay at anchor while waiting its turn to enter the Port Elizabeth Harbour. 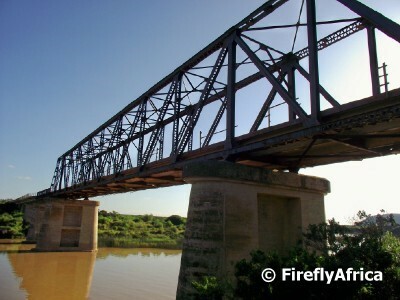 The picture was taken from Amsterdam Hoek across the Swartkops River under the Swartkops Bridge. The Boardwalk is quite good with organising kids entertainment during the school holidays. 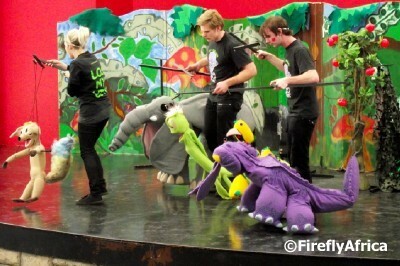 On Saturday afternoon we took the Rugrats to see the Babalela show. 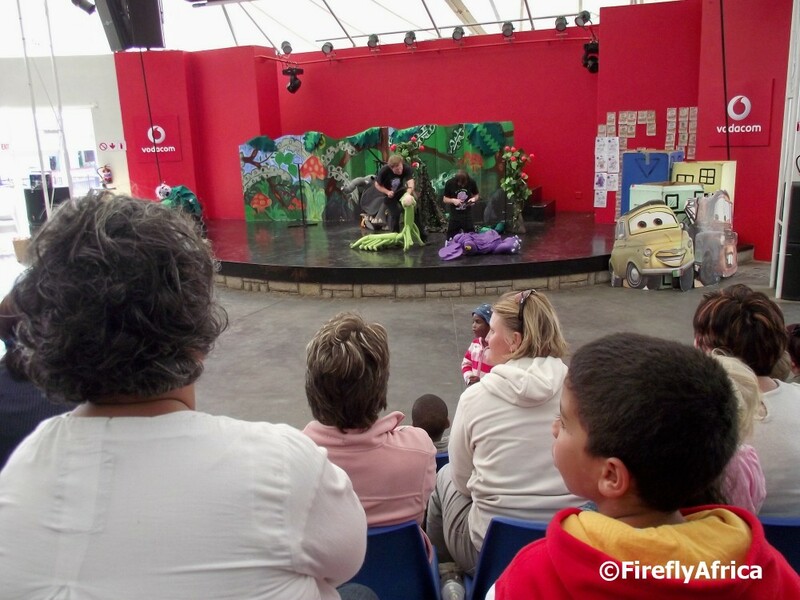 Babalela is a character from a series of Afrikaans children's books and the show covered the stories from all three of the books that has been published so far. Babalela is the purple face peeking out from under the leaves on the left of the stage. Some of the other characters have real Afrikaans tongue twister names. From left to right they are Meermoskat, Potifant, Wurmpie, Fripperwappertjies and Knortand. You can see I've read the books... for the kids of cause. 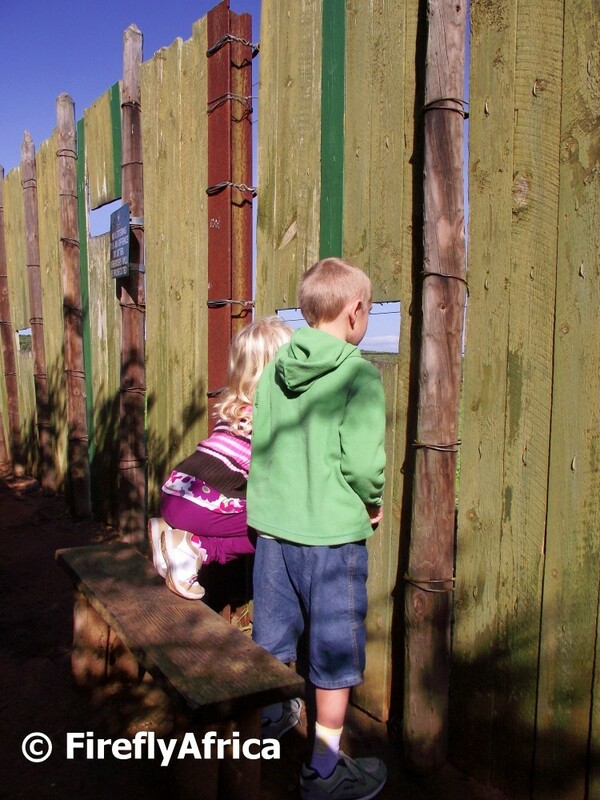 I mentioned the game viewing fence in the Spekbook enclosure in the Addo Elephant National Park yesterday. Somebody asked me what I meant by a game viewing fence. Unfortunately there wasn't anything for us to see on this specific visit, but I took this photo through that fence a couple of years ago. 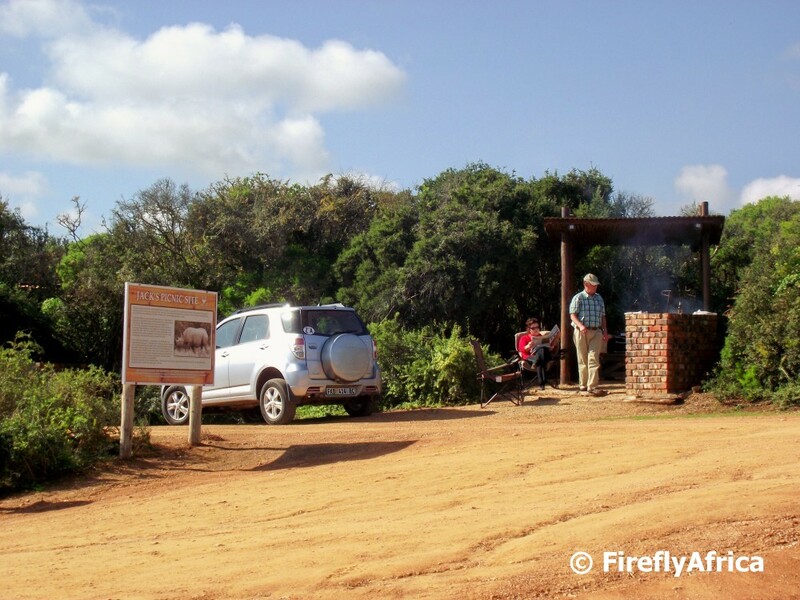 One of the spots in the Addo Elephant National Park where one can stretch your legs is the Spekboom enclosure. After parking your car you enter the secure area and walk about 40 meters or so through the bush to a game viewing fence right by a waterhole. 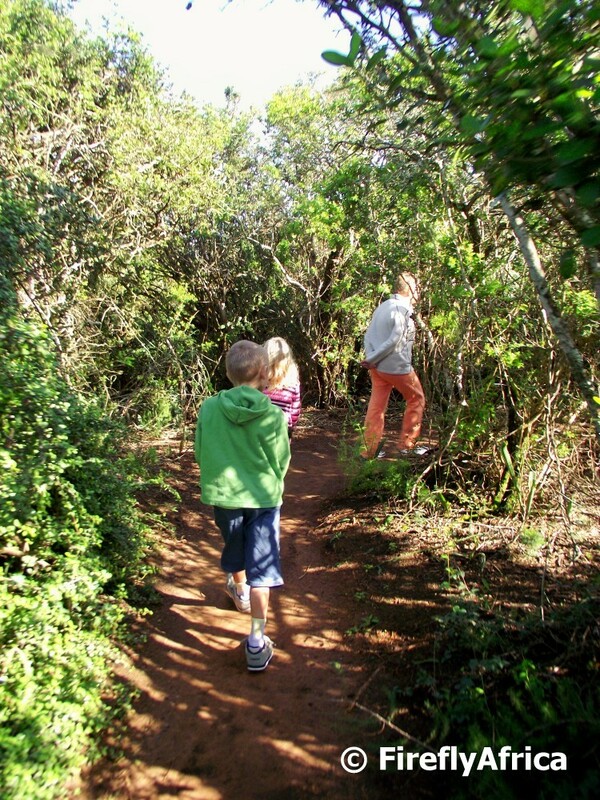 The walk gives you the better insight on what the bush looks like from within. Just imagine running down a game path like this looking over your shoulder at a 5 ton elephant bull crashing through the bush after you. 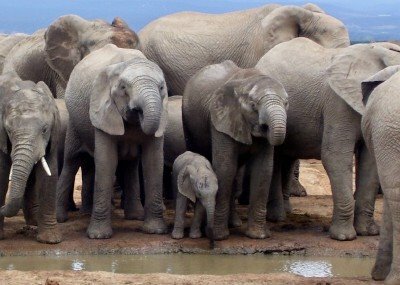 Addo Elephant National Park has two picnic sites for day visitors. The first one is at the main rest camp while a new one has been opened within the game viewing area close to the Spekboom enclosure. 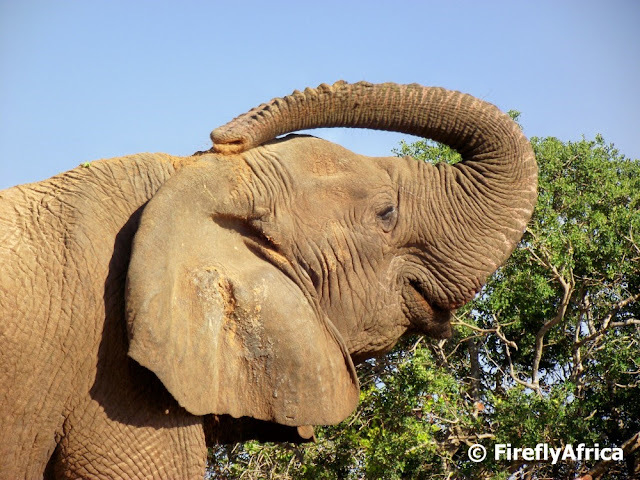 The picnic spot is situated inside a 500 hectare Botanical Reserve which is a protected area put aside to monitor the impact of mega-herbivores, particularly elephants, on the subtropical ticket vegetation. Plant species and vegetation structures within this reserve are compared with similar areas outside of it in the main game area to monitor long term effects of the animals on the vegetation. Jack's Picnic Site was named after Jack the Black Rhino who was one of the first black rhino to be brought to Addo and that was kept in this enclosure on the site where the picnic spot now is. Unfortunately I didn't take a picture of the actual sign to have the whole story on hand to give it to you. Next time, I promise. With all the rain we've been having the last couple of weeks we haven't had a lot of sunshine around. 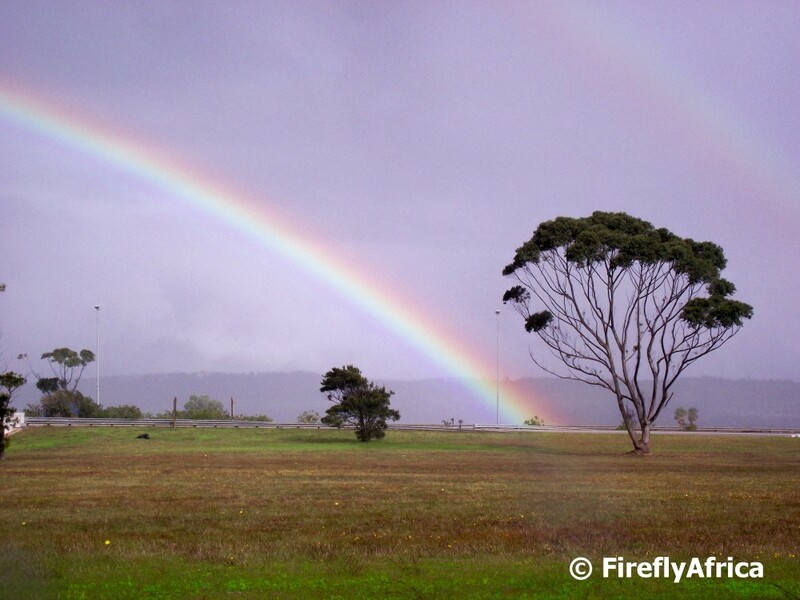 But when the sun does break through there is always a chance of a rainbow. Like this one I caught coming off the N2 at the Westering / Framesby off ramp. I often say that Port Elizabeth may be a full blown city, but its still a town at heart. Or in this case a bit of rural as well. Driving up Heatherbank Road between Charlo and Lorraine, one can easily forget that you are still in the city. The farms and small holdings in this area have a lot of horses, but also cows and other animals on them. 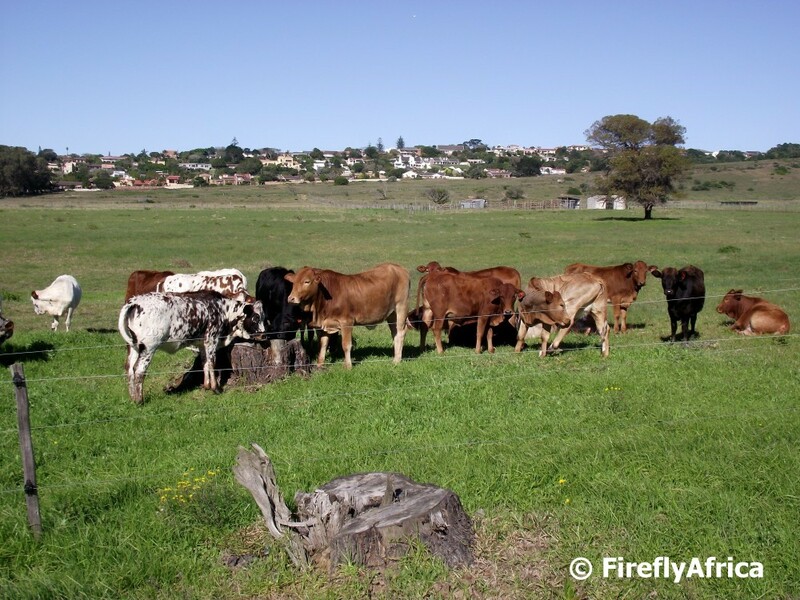 I stopped to snap a pic of these young cows with the upmarket suburb of Lovemore Heights in the background. 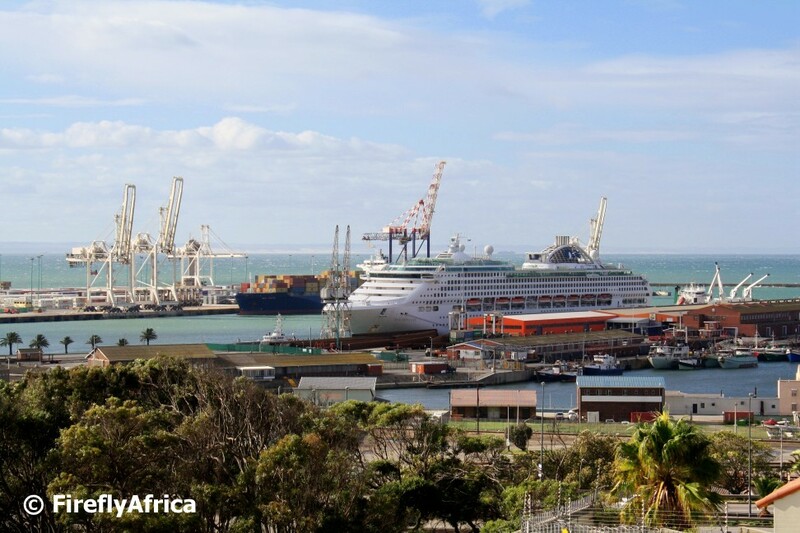 As a cruise destination Port Elizabeth unfortunately stands in line behind Cape Town and Durban. Over the years the tourism industry in the city had pushed hard for the harbour to be more cruise ship friendly to try and attract more ships, but unfortunately the harbour authority isn't playing ball saying that its not part of their core business. The good news is that research has shown that cruise ship visitors to the city exceed their expectations during their stay which shows that we should never give up trying. 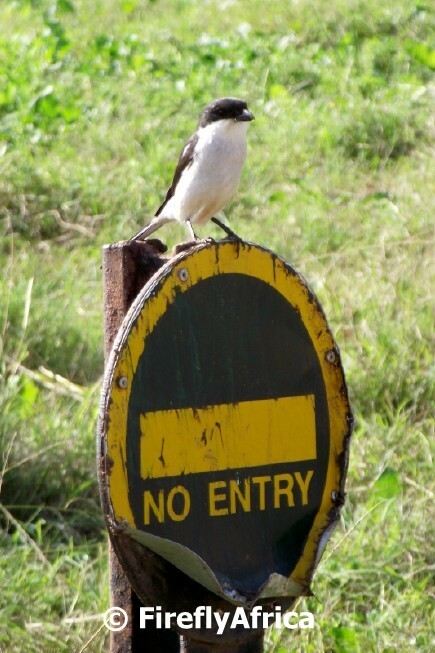 This Fiscal Shrike was sitting on the No Entry sign in the Addo Elephant National Park. It was as if he was guarding it and saying, "Don't you dare pass me!" The AHOY Boutique Hotel in Humewood is a very impressive wine cellar equipped with a boat shaped bar and stocked with an amazing variety of alcohol from all over the world. I was invited to a whisky tasting there the other day and was really impressed with not just the wine cellar but also with the establishment itself. 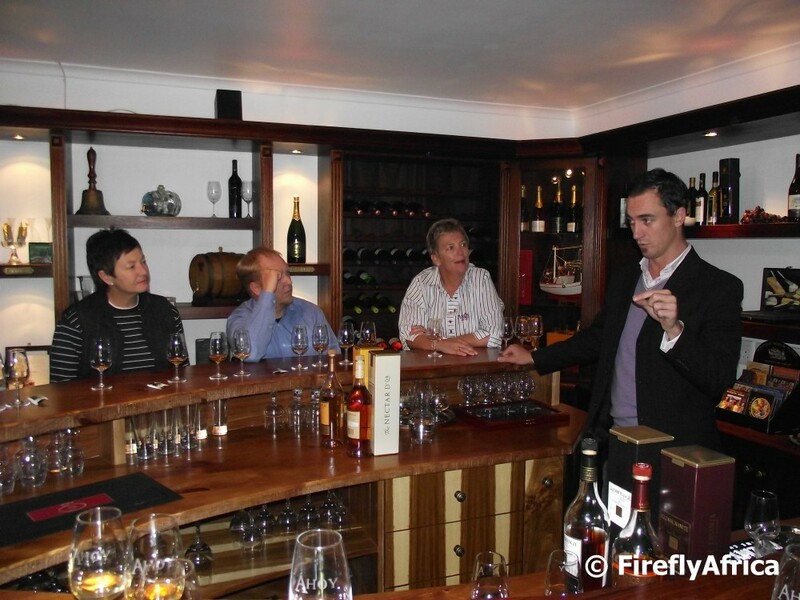 Read more about my whisky tasting experience as posted in The Firefly Photo Files. 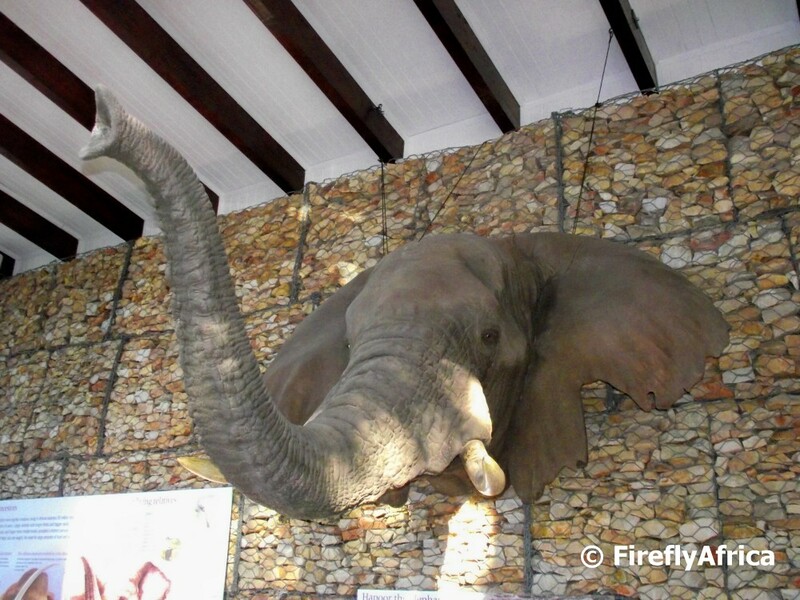 On the wall in the Interpretive Centre in the Addo Elephant National Park visitors will find the magnificent mounted head of the park's most legendary elephant, Hapoor. He got his name from the "hap" (Hap is Afrikaans for 'nick') in his ear (which is 'oor' in Afrikaans) thought to have been inflicted by a hunter's bullet. Hapoor was the dominant bull in the park for 24 years from 1944 to 1968. He had a deepfound hatred for man (thought to be because of the hunter incedent) and both the park's staff as well as young bulls knew to stay out of his way. In 1968 Hapoor was dethroned by a younger bull named Lanky and driven from the herd after which he became a loner. In that same year he became the first elephant to breach the elephant proof Armstrong Fence. Unfortunately the decision was made to shoot him because of his aggressive nature and his head was later mounted in the restaurant and moved to the new interpretive centre in 2010. 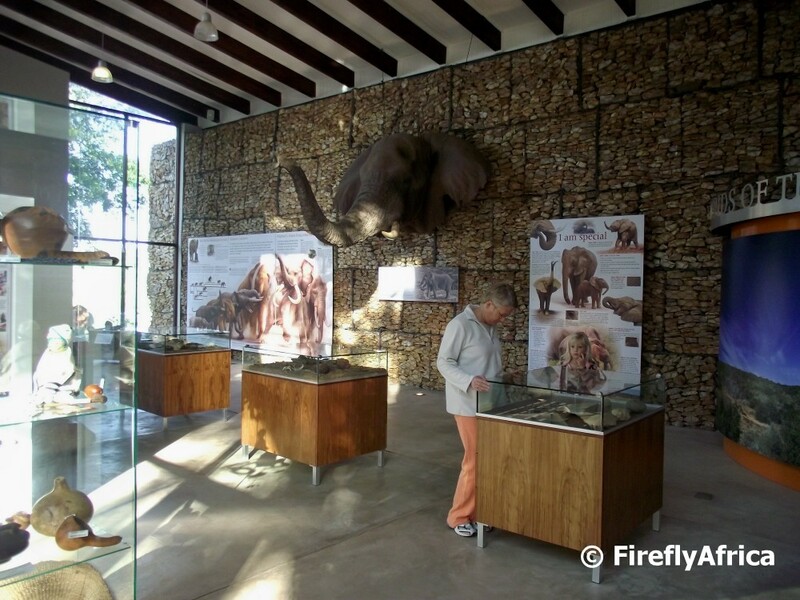 One of the attractions at the main rest camp of the Addo Elephant National Park is their Interpretive Centre. Opened in June 2011, the Centre is an interactive centre geared for both big and small. It covers everything from early fossils found in the area to info on prehistoric elephants modern elephants, animal sounds and insects. With the opening of the centre they also installed a webcam trained on the rest camp waterhole which can be accessed here.